Need a Plumber for a Leak Repair? Plumbing pipes and fixtures make up one of the most complicated systems in your home and require an expert plumber when a leak forms to ensure a water-tight solution. Leak repair is part diagnostics and part technique, with both elements combining to create a fix you can count on. The small details are what matter most when dealing with water lines and fittings, and every plumber on our expert crew has completed years of meticulous training when they show up, on time, at your door to diagnose and complete a repair. We have a reputation throughout suburban Philadelphia for providing courteous, thorough service and we won’t leave until the job is complete and you are fully satisfied. We stand out from other plumbers with our A rating on Angie’s List and a five-star ranking on Yelp. 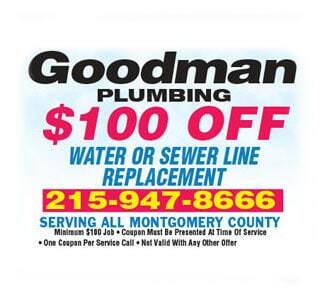 “The Best of Philly Magazine” recognized our emergency service as the finest around and you can reach us 7 days a week, 24 hours per day in the event of a plumbing emergency. 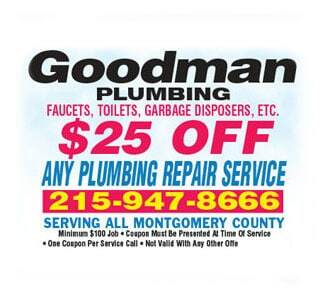 Goodman Plumbing is a second-generation, licensed master plumber with nearly 60 years of experience and a dedication to precise work and 100 percent customer satisfaction. Each and every staff member shares this drive to produce effective results with precision techniques and fine workmanship. Our business is made up of 90 percent repeat customers and we take client satisfaction and leak repair, no matter how small, very seriously. Emergency Leak Repair? Call Now! At Goodman Plumbing, Inc., we understand that leaks happen at all hours of the day (and night) and sometimes constitute a real emergency. Your home is one of your most valuable possessions and our job is to help you protect and repair it using proven techniques. Our licensed plumbers are standing by, 24 hours per day, 7 days per week for emergency repairs. Whether you have frozen pipes, a sewer situation or a suddenly-sagging ceiling, our leak repair team is here for you. 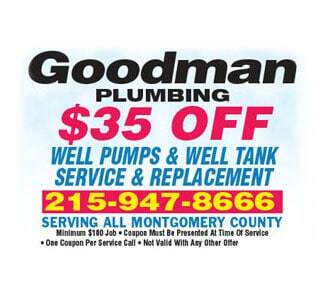 Call us today to schedule service from the best plumbers in Philadelphia.